The Vivian Girls makes music that’s a mixture of borrowed shades from shoegaze, thickly layered noise-pop, and garagey rock beats. It’s a heady concoction, but one that’s sure to leave you begging for more. The Brooklyn trio’s self-titled debut LP has already sold out, with a reissue coming out sometime during the fall. I’ve taken a listen to that said LP, and it doesn’t really make a compelling listen during the first time, so I’m assuming that these girls must put on one hell of a live show to have attracted so much attention. 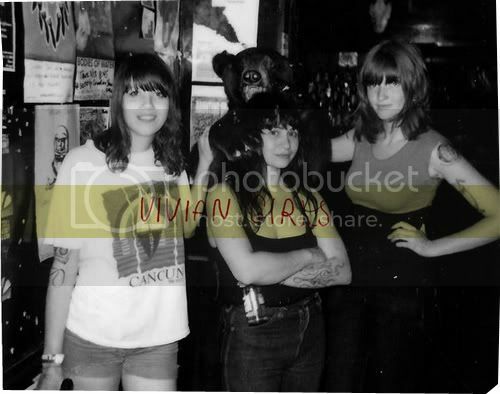 In order to satiate my Electrelane craving for the time and fill in that empty gap while the Brighton quartet is gone on an indefinite hiatus, songs by the Vivian Girls seems to do the trick and fit into that fissure quite perfectly. In ‘Tell the World’, the music closely resembles the rocking tunes of the aforementioned alternative-rock, all-girl group, especially during that first minute. But, the more heavily inspired shoegazey number, ‘Where Do You Run To?’ is the true highlight of this record: set against the fuzzy, dreamy backdrop, are airy, girl-group, vocal harmony parts, that’s given an all round lo-fi treatment, thus quickly proving that these Brooklyn gals are anything but ordinary. 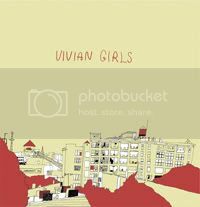 |mp3| Vivian Girls - Where Do You Run To?